The small Canary Island of Lanzarote was subjected to one of the modern world’s longest ever volcanic eruptions during the 1730´s. Which lasted for six years and which buried around one third of the island beneath a sea of lava. Obliterating some of the best farming land on Lanzarote and forcing many islanders to emigrate for a new life abroad. Today however, the Timanfaya Volcano Park, which sits at the epicenter of these eruptions, is one of Lanzarote´s leading tourist attractions. Drawing in around 900,000 visitors every year. As the terrain here is truly out of this world – and is often in fact likened to the surface of the moon. Apparently Apollo 13 astronauts where shown pictures of the landscape here in order to prepare them for their own lunar missions. It’s possible to take a coach tour around the park – which enables visitors to get up close and personal with the mile after mile of spent volcanic cones and twisted lava shapes. 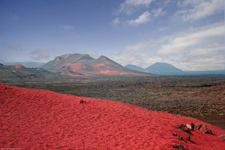 Minerals from the volcano have covered many of the peaks in rusty reds and oranges – creating a truly unique landscape. Touring by camel is also an option – although the ships of the desert just patrol the outer reaches of the Park in order to ensure that their hooves don’t destroy the lava fields. There´s also a fantastic restaurant in the centre of the Park, where food is cooked over a barbecue using the heat from the volcano below. Visitors find out more about Lanzarote and its many attractions by downloading a free Guidebook to the island from the Lanzarote Guidebook website. Join in and write your own page! It's easy to do. How? Simply click here to return to Getaway Stories.